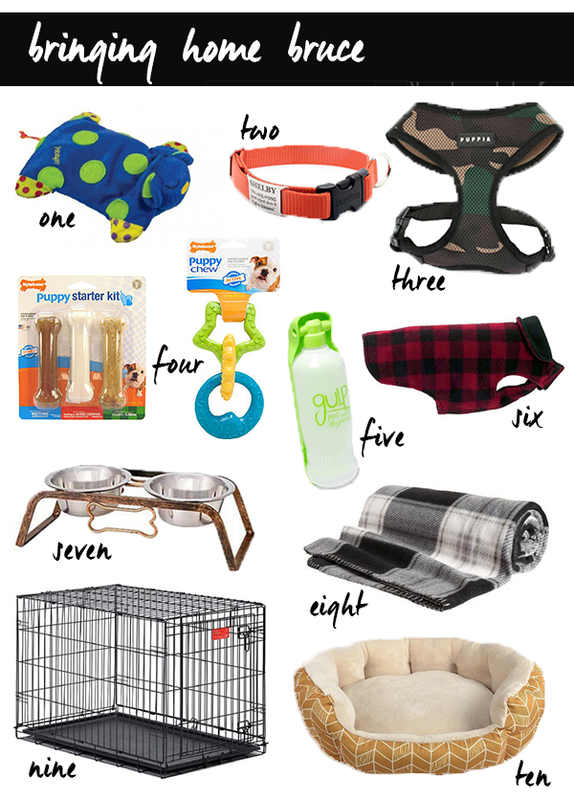 As Max and I prepared to bring home our pug baby bruce we found ourselves discussing discipline, puppy-proofing our home, and buying an insane amount of supplies to prepare for our little guy. It’s amazing how much getting a puppy together is like parenting - so far so good! As we prepared to bring home our fur baby there were so many things we felt we needed to make his transition a smooth one. We brought him home Saturday and we are completely in love. Here are the top ten things that we found to be essential for bringing home bruce and where to find them! one // this petstages puppy cuddle pal can be heated in the microwave in order to provide warmth and comfort to your new puppy and help make his transition away from his mother and litter makes an easier one. I'm not sure how much he likes it but we're all for anything that comforts him as he adjusts to sleeping in his crate. two // we recently saw a lost dog sign in our neighborhood which was a major reminder that we need to keep a collar with tag on Bruce at all times in case he was to get out or off the leash. He's not the biggest fan of his jingly tag so once he’s a little bigger we plan to go to this slide on ID style so we don’t have to hear the constant jingle. three // since pugs have such rounded heads and flat faces, they have to have a harness for walking otherwise the collar will just slip right off their head. Puppia soft harnesses are soft and stylish, perfect for our little guy and just too cute! nine // crate training is essential for training and gives bruce a cozy place to feel secure. We got a life-stages adjustable crate that can grow as he grows and are so glad that we did! ten // we love the small dog beds from target because they’re soft and cozy and cheap! They used to also sell matching covers which you can just swap out for washing and keep their beds clean and fresh but I can't find them anywhere! Hoping they will bring those back because they were the best. Do you have any other great ideas or resources for bringing home puppy?